HubSpot remained strong in first place with a healthy lead and an overall total of 92 points, scoring a perfect 20 for reviews, integrations, and media, and a 19 for its mobile apps. Cloud-based business apps marketplace GetApp has released its Category Leader ranking of the top 25 Marketing Automation solutions for this quarter. HubSpot and Infusionsoft stayed in first and second place, respectively, over last quarter, while Pardot made its way into third place for the first time this year. Big names Salesforce Marketing Cloud and Marketo rounded out the top 5 in fourth and fifth place for Q3 2016. The ranking, aimed at business owners with small to mid-sized operations looking for a piece of software for their company, is based on five factors to be able to provide a shortlist of solutions. These five factors include: user reviews, software integrations, mobile app availability, media presence, and security. Each factor is worth 20 points, for a total possible score out of 100. “HubSpot remained strong in first place with a healthy lead and an overall total of 92 points, scoring a perfect 20 for reviews, integrations, and media, and a 19 for its mobile apps. Runner- up Infusionsoft scored 77 with high scores of 17 for integrations and mobile app availability, while Pardot managed to inch its way into third place with 66 points and a high score of 16 for media and integrations. Notably, 20th place iContact Pro Automation received the highest security score with 19 points,” says Suzie Blaszkiewicz, project manager of GetApp’s Category Leader rankings. 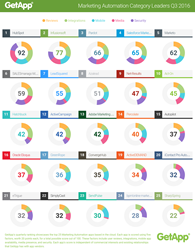 See the entire Q3 2016 ranking of the top 25 Marketing Automation solutions here.